Many American cooks (even experienced ones) are intimidated by Chinese cuisine. Some are scared away even before they start — by that long list of unfamiliar ingredients. Then there’s all the preparation required. Mise en place is a French term, but surely the Chinese must have invented the concept. You can’t cook Chinese unless you first do your mise en place, and a lot of it. And, of course, there are some unfamiliar cooking techniques. (A stir-fry is like a sauté — but not quite.) So that can be a bit scary, too. Well, good news! The stir-fry method I use here is easier than the “classic” technique. It’s more of a braise (the pork is stir-fried but the vegetables are braised in liquid). And the flavor is excellent. As for the rest? Let’s just jump into the recipe, and you’ll see. Everything will become clear as we go along. You need a large frying pan (12-inch is ideal, nonstick is optional). Most modern Western stoves aren’t suited to wok cooking, particularly the electric ones, so a big frying pan is a good substitute. But if a wok works for you, go for it. 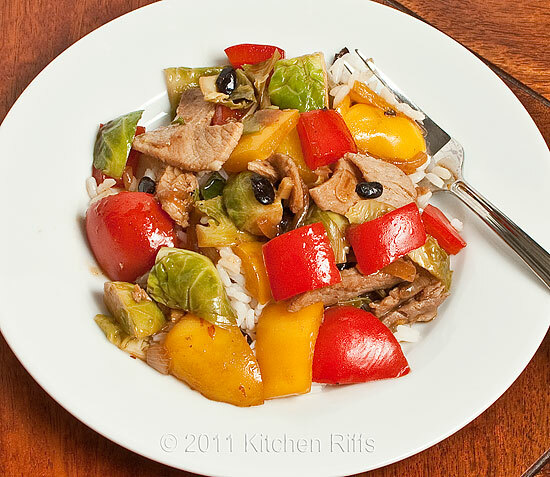 My recipe is vegetable-centric, though it does call for a small quantity of pork. It also works well if you leave out the meat entirely and make it a vegetarian dish. In that case, use vegetable stock or water rather than chicken stock. The recipe serves 2 – 4 depending on your appetite or what side dishes you include in the meal. This is the most time-consuming part of Chinese cooking. But time spent here makes the actual cooking fast and easy. This dish tastes good without pork — but better with. So if you are using it, slice the pork thin. Cutting across the grain works best. It’s easier to get thin slices if the meat is somewhat frozen. I either put it in the freezer for about an hour, or remove already frozen meat and put it on my kitchen counter to thaw for an hour or two. I like slices that are about 2 – 3 inches long and no more than ½ inch wide. Which means that after I slice the meat, I often cut the slices in half lengthwise. Peel onion, halve down the poles, then slice into strips across the width. Place in bowl or on plate. 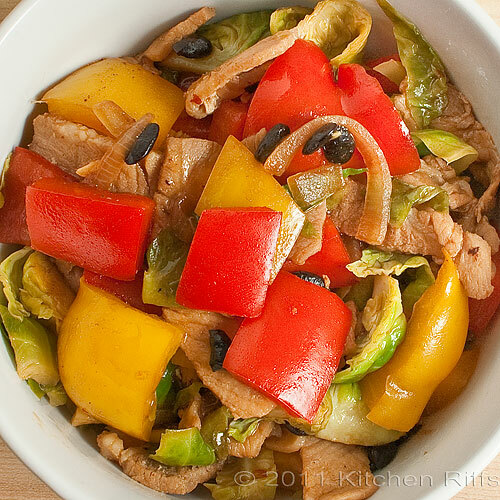 Wash the bell peppers, cut in half, discard the stems, seeds, and ribs. Cut into 1-inch squares (or if you prefer, cut into strips similar to the size of your pork slices). Add to onion. Wash Brussels sprouts. Remove loose leaves from exterior, cut off stem ends, and then quarter each sprout lengthwise. Add to onion. Peel garlic and slice thinly (or dice the garlic fine if you prefer). Put in small bowl or plate. Peel ginger and dice fine. Add to garlic. 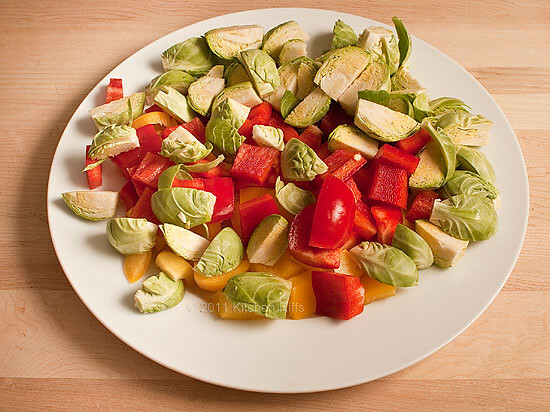 To speed the cooking process (and make it easier), arrange your ingredients in the order you need them: oil first; then meat; then onion, peppers, and Brussels sprouts; then garlic. After that, black beans, (optional) red pepper flakes, chicken stock, light soy sauce, and Shaoxing rice wine or dry sherry. The cornstarch/water mixture comes in at the very end. For stock, I usually use soup base because I can mix the quantities I want. But if you prefer, you can use frozen or canned chicken or vegetable stock. You can even use water. In that case, the flavor won’t be as rich, so you might want to add a bit more soy sauce. I don’t premeasure the light soy sauce or Shaoxing rice wine, but pour by eye and taste. So I just have the bottles at the ready when I start to cook. Heat large frying pan on high (if using nonstick, keep heat at medium-high in order to preserve the finish). When hot, add 2 tablespoons of oil. Once the oil is heated (this takes only a few seconds — it will shimmer and start to smoke), add the pork (with marinade sauce). With a large spoon or spatula, immediately begin to stir-fry it (i.e., move it around in the pan, and keep it moving) until cooked through. This will take about two minutes. Remove pork from pan with a slotted spoon and set aside. Add more oil to pan if necessary and let it heat (you want about 2 tablespoons in the pan for the next step). Add vegetables and stir fry for about a minute. Clear a space in the middle of the vegetables with your spoon or spatula and add ginger and garlic. Stir fry with the vegetables for another minute. Add the black beans and the red pepper flakes (if using). Stir into vegetable mixture. Add ½ cup stock, the soy sauce, and the Shaoxing rice wine or dry sherry. If you judge there isn’t enough liquid in the pan to braise the vegetables, add more stock. Stir the liquids into the vegetable mixture, cover frying pan, and turn to medium-low. Let vegetables braise until done (about 5 minutes). “Done” means vegetables are cooked through and toothsome, but may be somewhat crunchy. If you don’t like crunchy, cook longer. Uncover pan, stir pork into vegetables, and taste sauce. Add more soy sauce or Shaxoing wine/sherry if you judge necessary. Reduce heat to low and stir in half the cornstarch mixture. Simmer for a minute and judge the consistency of the sauce. If you want a thicker sauce, stir in more corn starch. Remove from heat and serve with cooked rice. The only “unusual” ingredients in this recipe are the fermented/salted black beans, the Shaoxing rice wine, and the light and dark soy sauces. Fermented black beans (or dou chi) are soybeans that have been dried, soaked in water, steamed, and then fermented. 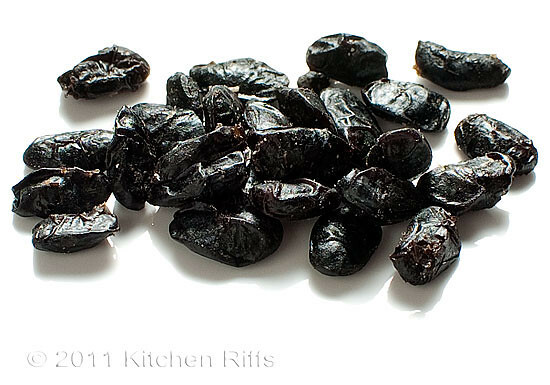 Sometimes called “black salted beans,” they are an essential ingredient in Hunan cooking. They look a little like raisins and taste somewhat like intense, concentrated soy sauce. Occasionally, you see them flavored with ginger. They will keep for a long time (over a year). After I open a package, I put them in an airtight container that I place in the refrigerator. (I’m overcautious. They’ll keep fine in a pantry too). They usually are sold in plastic bags (sometimes in canisters) and can be found in virtually any Chinese grocery. They are also available at Amazon. Most cookbooks (not all) suggest rinsing before use, so I usually do. Shaoxing wine (or liao jiu) is the most famous variety of Chinese rice wine. Its flavor is very similar to dry sherry (which makes an excellent and readily available substitute). Most Chinese groceries stock this wine. But because it is an alcoholic beverage, local laws may place restrictions on its sale. The alcohol content is fairly low, so once opened this wine will last longer if stored in the refrigerator (the same goes for dry sherry). Soy sauce (or jiang you) comes in “light” and “dark” varieties. 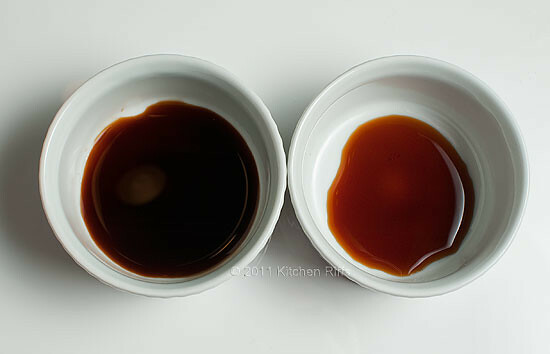 Light soy sauce is thinner than dark and much saltier. If the bottle doesn’t specify which kind it is (in American supermarkets, most bottles don’t) assume that it’s light. Dark soy sauce is darker colored than light and is sweeter, less salty, and has a heavier consistency. It is often used in marinades (as in this recipe) or in dipping sauces. Dark soy sauce is nice to have, but not necessary for this recipe (you’ll lose a little oomph, but just a little). Pearl River Bridge is one widely available brand of Chinese soy sauce of good quality, and comes in both light and dark varieties. Kikkoman soy sauce (a “light” sauce) is available in every supermarket and is my choice when I am not using a Chinese soy sauce. It will work fine in this recipe. The “lite” soy sauces you see on supermarket shelves just have reduced sodium; they are not the same as either dark or light Chinese (or Japanese) soy sauces. Learning to cook Chinese was a challenge for me. For a long time, I was out of my comfort zone even when ordering in a Chinese restaurant. I would usually fall back on a narrow range of dishes because I knew their flavors and understood how they were constructed. And I knew how to eat them – sometimes a consideration when faced with unfamiliar dishes. My ignorance was holding me back. This lack of knowledge can run both ways, of course. Fuchsia Dunlop writes in the August 2005 issue of Gourmet magazine about her experience introducing three famed Sichuan chefs to Western food. In a visit to Thomas Keller’s well-known French Laundry restaurant, she discovered that some prized Western dishes puzzled (or even revolted) her guests. Rare lamb? “Dangerous” said one of the chefs. “Terribly unhealthy.” Food cooked rare is virtually unknown in China. As Dunlop explains, “the consumption of raw foods was historically viewed as a barbarian habit,” so all food is thoroughly cooked. The Sichuan chefs realized that their lack of understanding was preventing them from enjoying their food. “It’s like not knowing a language,” said one. I can understand where those chefs where coming from. For me, at least, it’s through cooking a cuisine that I learn to taste it. Over much of the past decade, I dabbled in Chinese cooking, but never became proficient. I didn’t know where I was going. Until the last year or so — when I decided to make a more serious effort. Now I find that I’m learning more than just how to assemble recipes. I’m also beginning to understand flavor and ingredient combinations. As with all my cooking, the goal isn’t to be “authentic.” (Why should it be? Authenticity is a concept that would never trouble me when putting together an Italian-style tomato sauce, for instance). Instead, my aim is to learn the grammar and syntax of the cuisine so I can develop my own take on it. What matters to me is the final flavor. I’m not yet proficient at cooking Chinese, but I’m adequate. And I’m turning out some pretty tasty dishes. So how about you? Are you ready to conquer your fear? You’ll probably surprise yourself — and you will definitely get some really good eats. Even if you pass on the shark’s-fin soup.